A Father's Day card is a touching and straightforward way that you can let the dad in your life know how much you love him and what he means to you. These free, printable Father's Day cards come in all different designs from Darth Vadar to a paper tie to a retro gaming card. There is a card here for any dad, no matter what his interests are. The free Father's Day cards look best when printed on cardstock, but you could use regular computer paper in a pinch. After you print, add your message, and you're ready to make dad smile. You can also grab some Father's Day coloring pages and DIY coupons. 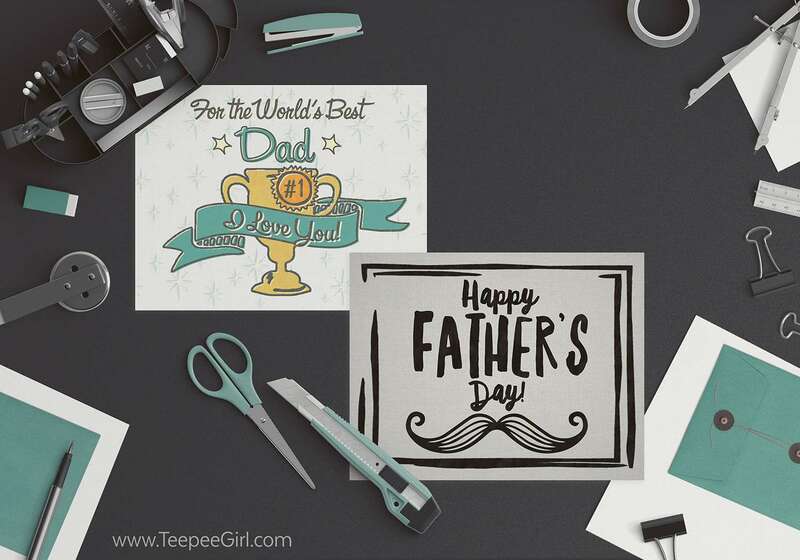 These two free, printable Father's Day cards from Teepee Girl would be great for any age of dad, that's any relationship to you. They are some universal cards that any dad would love to get. One of the cards features the phrase "Happy Father's Day!" with a picture of a mustache, while the other card says "For the World's Best Dad, #1, I Love You!" with a trophy on it. There's even a free envelope template included that will fit your card perfectly. 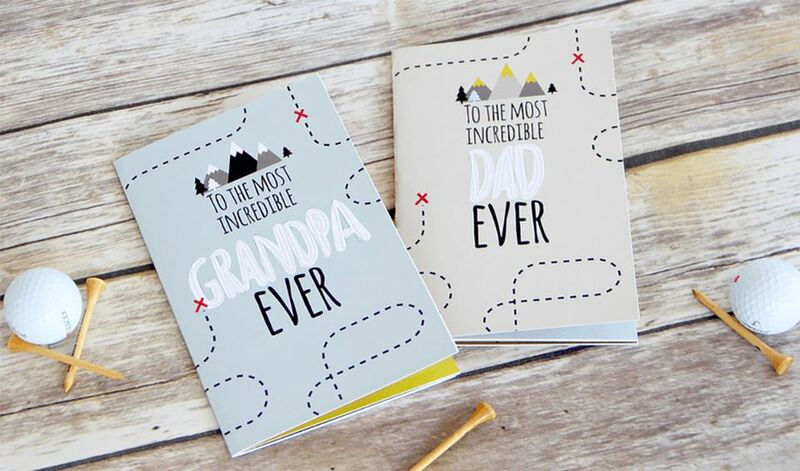 These two adorable Father's Day cards are actually booklets, one for dad and one for grandpa. Inside the adorable covers is a place where kids can draw photos of dad, fill in the blanks about what they love about dad, and even create some love coupons. All the Star Wars fans who are fathers out there are sure to love this card that features Darth Vader along with the phrase "I Am Your Father...'s Day Card." There are three slightly different cards to choose from here, and we're sure dad would love to get any of them this Father's Day. These Daddy Ties from Kiki and Company are just adorable. The outside of the tie comes in three different colors: blue and white, orange and white, and green and white. Open up the tie and inside is a questionnaire that kids can fill out to tell dad what they like to do with him, why they love him, and more. The retro dad is going to love this unique Etch a Sketch lookalike card from Zakka Life.​​ Just print out the card on cardstock and then cut it out on the outline of the card. Now it's time to hand it to the coolest dad you know. Now, this is a unique Father's Day card that still feels classic. Print out this Father's Day card and let dad have some fun finding the secret message you're sending him. There are three printable Father's Day cards here, and I honestly can't decide which one I like best. You can print a Father's Day card that says "#1 Dad", "Thanks, Dad," or one that features a tie. Sweet Scarlet has an adorable free Father's Day card available that's perfect for a child to give to their daddy. All you'll need to do to get this Father's Day card ready to go is print it and cut it. The first card here is a simple printable that says "Real Men Have Kids" and leaves you room to write a message inside. The second Father's Day card is a part card and part craft for young children to complete for their dads. The child completes the drawing of themselves and their dad plus lists the top 3 reasons they love their dad. So cute! You'll have your choice of 3 different Father's Day cards here that a bright and cheerful. Just click the download link to get these free Father's Day cards. You won't only get a printable Father's Day card here, but you'll also get free printable party tags, labels, napkin rings, invitations, favor tags, and a Happy Father's Day banner. There are several types of Father's Day cards here so you can choose to print off the basic design, one that says thank you, or one that leaves some space for your child to draw a picture.